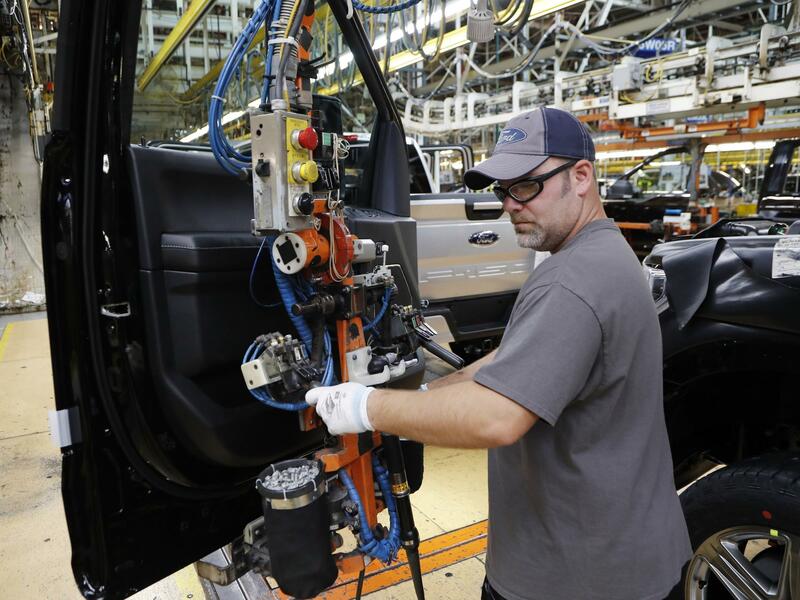 A worker installs a door on a 2018 Ford F-150 truck at an assembly plant in Dearborn, Mich., on Sept. 27. The U.S. unemployment rate fell to 3.7 percent in September, a nearly 50-year low. The U.S. jobless rate dropped to 3.7 percent in September — the lowest since 1969, though the economy added a lower-than-expected 134,000 jobs, the Bureau of Labor Statistics said. The jobless rate fell from August's 3.9 percent. Average earnings rose 8 cents, to $27.24 per hour last month. But wage growth slowed, with average hourly earnings up 2.8 percent from a year earlier, compared with a 2.9 percent increase in August. The economy has now added jobs for nearly eight straight years. Private economists had forecast that the economy would pick up 180,000 jobs in September. The net jobs created in July and August were revised sharply upward by a combined 87,000 — offsetting September's weaker showing. BLS noted that Hurricane Florence affected parts of the East Coast during the period that the government's employment surveys were conducted. The leisure and hospitality sector saw a drop of 17,000 jobs last month and BLS said that the storm may have been a factor. In August, that sector saw an increase of 21,000 jobs. In September, professional and business services grew by 54,000, transportation and warehousing jobs by nearly 24,000, construction by 23,000, manufacturing by 18,000 and health care by nearly 30,000. But retailers cut 20,000 jobs. The report reinforced the view of Federal Reserve policymakers, who cited a strong job market when they announced they were increasing a benchmark interest rate — the third hike in a year. The labor market, the Fed said, "has continued to strengthen and ... economic activity has been rising at a strong rate. Job gains have been strong, on average, in recent months, and the unemployment rate has stayed low." The Fed is forecasting the economy will grow 3.1 percent this year — that's up from the 2.8 percent it projected in June.